I love Artifact, but it's clear that many of those who bought it, didn't. Part of the reason for this, I suspect, is because it's much more complex than Hearthstone, had some wonky balance at launch, and the Market Place is misunderstood. Combine that with the lack of progression (though this has since been rectified), as well as the initial asking price, and you've a recipie for disaster. If you also consider that it's not the easiest game to follow - especially considering it's played across three lanes - is its lack of success surprising? While there's no word from Valve on how they intend to stop the rot, things aren't looking good. 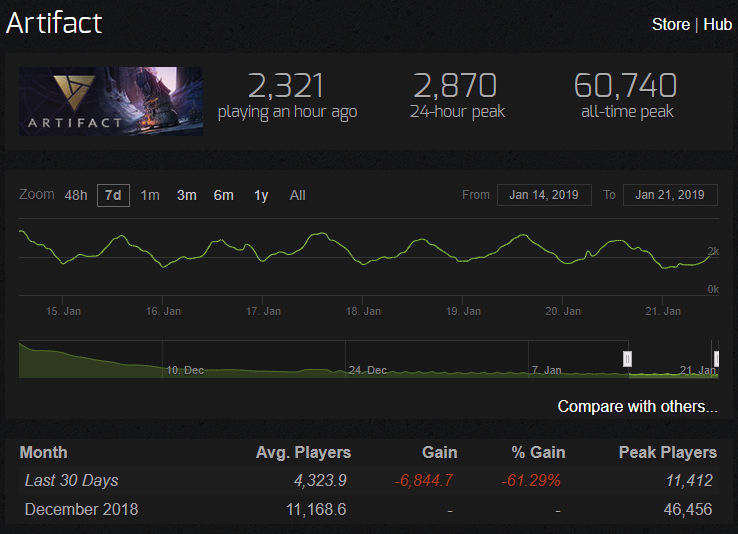 Since launch, its dropped from an all-time peak of 60,740 players, to just 2,870 24 hours ago: a 95% drop. Ouch.